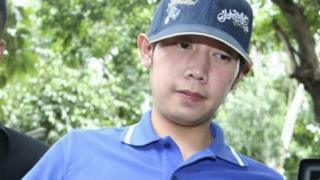 Thai police say the heir to the Red Bull empire Vorayuth Yoovidhaya, who is wanted in Thailand over the death of a police officer, has fled to Singapore. Authorities have said he left last Tuesday, days before a warrant was issued for his arrest after he failed to show up to face charges. Mr Vorayuth allegedly knocked down the officer while speeding in 2012. The high-profile case has attracted criticism that the elite enjoy special treatment from Thai authorities. Singaporean police and aviation authorities did not immediately respond to the BBC's request for comment. The Associated Press news agency said Singapore airport authorities had confirmed with them that Mr Vorayuth's private plane was in the country as of Tuesday. A representative at Seletar Airport, which receives private aeroplanes, told the BBC that they were "unable to release any information" and declined to give a reason. Singapore does not have an extradition agreement with Thailand, but the two countries frequently co-operate in transnational cases. Mr Vorayuth has repeatedly failed to meet Thai police to face charges of speeding, reckless driving causing death, and fleeing the scene of an accident. Some charges have since expired. His representatives have said each time that he was either away for business or too ill to meet police. Thai news outlets quoted police as saying that Mr Vorayuth travelled to Singapore on 25 April, and that they were unable to stop him as this was before the warrant was issued on Friday. A police spokesman also told The Nation newspaper that they did not put in place a travel ban as the case was about recklessness rather than one of criminal intent. Thai investigators are now seeking to cancel Mr Vorayuth's passport.